COLORADO SPRINGS (Sept 13, 2016) — The Colorado Springs Fine Arts Center’s First Friday Art Parties on Oct 7 and Nov 4 present an exciting show for the time‐honored Day of the Dead celebration with works on view and on sale Oct 7‐Nov 27, 2016. The opening reception event on Oct 7 also includes a traditional invocation dance by Grupo Folklorico Sabor Latino at 5:30p. Also known in Spanish as El Dia de los Muertos, this celebration honors those who have passed on to the next world with ceremonial elements rooted in Aztec culture. The FAC’s version of this celebration includes an invitational selection of Colorado artists whose work exemplifies traditional Day of the Dead artwork. Participating artists include: Carlos Fresquez, Quintin Gonzalez, George Rivera, Tony Ortega, Azul DelGrasso, Josiah Lee Lopez, David Ocelotl Garcia, Judy Miranda, Terry Sanchez, Roberto Rodriguez, Jerry Vigil. 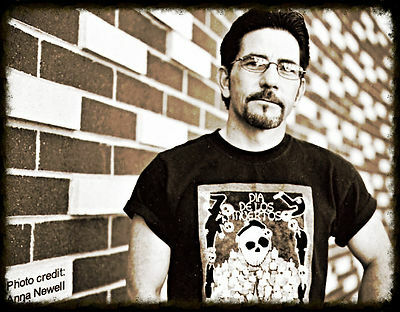 Known as “Denver’s Dean of the Dead,” now residing in Colorado Springs, internationally‐exhibited artist Jerry Vigil is a self‐taught Chicano artist who creates Santos art (Saint making) and Muertos art (Day of the Dead/El Dia de los Muertos) as a statement of culture. The two styles, both set within a known and sometimes rigid formula, are at opposite ends of a cultural spectrum. Jerry’s creative process contemporizes the styles by incorporating modern materials and design. Jerry’s artwork has appeared on the cover of Marketing Review and Denver’s Westword, at the Mexican Fine Arts Center Museum in Chicago, inside Lowrider Arte, Denver, and 5280 magazines. Jerry is a profiled artist in the 2005 ASU/Bilingual Press Publication Triumph of our Communities: Three Decades of Mexican American Art. Jerry is also a co‐author of a book on El Dia de los Muertos Crafts. Jerry has also received Westword’s Best of Denver and Best of Santa Fe Drive awards for multiple years. Jerry has lectured on his art and art topics at all the major Front Range colleges, has artwork in the Regis Santos teaching collection and artwork in Museums along the Front Range, including the Colorado Springs Fine Arts Center. David Ocelotl Garcia’s work ranges from large‐scale interior and exterior murals, painted directly on existing surfaces, panels, cloth and canvas, to mosaic and sculpture. His sculpture is ever expanding and ranges from bronze to mixed media. His art is culturally diverse, inspired by tradition, history, nature, science and everyday life. He creates art using a technique called Abstract Imaginism, a style of art he developed that combines the spontaneity and unpredictability of abstraction with the creativity and perception of his imagination. Tony Ortega holds a Masters in Fine Arts in drawing and painting from the University of Colorado and is currently an associate professor for Regis University. He is the recipient of the coveted Governor's Award for Excellence in the Arts (1999) and the Mayor's Award for Excellence in the Arts (1998). He has been a working artist and teacher for the past 33 years and is known for his vibrant, colorful artwork. Tony Ortega’s lifelong goal is to contribute to a better understanding of cultural diversity by addressing the culture, history and experiences of Chicanos/Latinos through his art. His work can be found in the Denver Art Museum, Los Angeles County Museum and the Colorado Springs Fine Art Center. He has exhibited extensively in the United States, Latin America and other parts of the world. Where: Deco Lounge at the Colorado Springs Fine Arts Center, 30 W. Dale St. Even more: The opening reception event on Oct 7 includes a traditional invocation dance by Grupo Folklorico Sabor Latino. The performance is scheduled for 5:30p and is sponsored by El Cinco de Mayo, Inc. and the Cultural Office of the Pikes Peak Region (COPPeR). Manuel Ramos is the author of several novels, short stories, poems, and non-fiction books and articles. His collection of short stories, The Skull of Pancho Villa and Other Stories, was a finalist for the 2016 Colorado Book Award. My Bad: A Mile High Noir is scheduled for publication by Arte Público Press in October, 2016. Chicanonautica: Did You Hear the One About . . . If You’re Spider-Man, Why Are You White? International Latino Book Awards 2016!